As companies embrace hot-desking and bring-your-own-device policies, IT administrators and CIOs face new challenges in workplace design. Portability, connectivity, efficiency, office intelligence, and user experience are at the core of today’s infrastructure decisions. Rethinking individual workspace design is critical as organizations endeavor to address these needs. Installing ergonomic tools can transition a traditional workspace— locked chairs, fixed-height desks, static computers that require awkward postures, and outdated peripheral docking devices—into an active and healthy workspace that is in sync with the modern, connected office. IT departments have controlled computer equipment purchasing for some time, but this is changing. With the rapid consumerization of IT, employees are now buying more of their own devices for use at home and at work. The result is the BYOD (also referred to as BYOL and BYOC) phenomenon, which is bringing considerable policy and procedural changes to procurement, manageability, security, and compatibility. BYOD can generate substantial advantages—like employee satisfaction, productivity gains, increased flexibility, and reduced costs—yet it also raises a number of new challenges. Security, device compatibility, support, futureproofing and interoperability are now key considerations in policy-management and infrastructure-purchasing decisions. Ultrabooks and the new “thin-and-light” segment have been growing in popularity for several years. They appeal to employees due to their power and portability, yet the thin designs have led to a significant reduction in available connections. Ultrabooks only offer one or two USB ports. In addition to new portable devices, multiple workspace monitors are gaining in popularity. 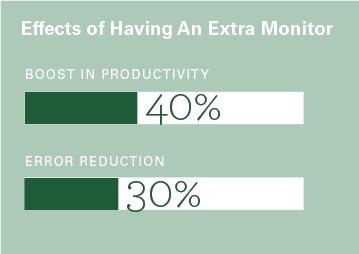 Research has shown that an extra monitor can significantly boost productivity by up to 40% and can reduce errors by up to 33% (when documents and data can be viewed side-by-side in an expanded digital workspaceii), so it is no surprise that both companies and workers find added value in additional screens. However, with two—or even three— monitors, an Ethernet connection, a printer/scanner, mouse, keyboard, optical disc drive, external hard drive, speakers, and/or flash drives, there is no way to utilize these peripherals without a docking station. The solution is typically an external docking station, which provides plenty of connectivity but produces cable clutter, reduced workspace, and less accessibility to user ports. What’s more, many simple hubs do not support powered devices, which means additional calls to IT for help on unsupported devices. Adapters can be used to connect to Ethernet and VGA, but they can be expensive and easily misplaced. The need for a docking solution that streamlines the workspace, provides enough ports, and offers quick access to USB hubs is stronger than ever—especially in a world where company desks are no longer used by just one individual. An increasingly mobile workforce and rising real estate costs are evidence enough that there needs to be a major shift in how workspaces are designed— but now individual workspaces require features that can be easily used and quickly adjusted to suit the needs of multiple users. Hot-desking, or desk sharing, first appeared in the 1980s. Back then, it was limited by technology and flexibility. Today, with the advent of work-at-home policies, companies are creating entire hot-desking offices. There has also been a surge in co-working spaces, where desks can be rented for specific amounts of time by anyone. All of the changes to the corporate landscape over the last decade point to one universal truth: the office of the future is here. The problem is that most workspaces are stuck in the past. It is important that individual workspace design evolves to support today’s technology needs while also providing a healthy and comfortable user experience. 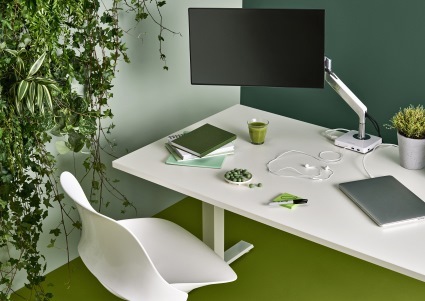 Ergonomic workspaces are not only healthier and ready to offer support for required technological devices, but they also promote an engaged and productive work environmentiii. A flexible, flat-panel monitor arm with multi-screen capacity is a good place to start when transforming a traditional workspace into a modern, ergonomic workspace. Cost-effective and easy to install, a monitor arm frees up valuable desk real estate and is an investment in the well-being of workers. Not only can monitor arms be easily adjusted to the needs of each unique user, a monitor in the ergonomically correct position helps to reduce stretching and straining, which in turn reduces visual fatigueiv, upper extremity musculoskeletal discomfort, and computer vision syndrome symptomsv. A suitable arm should be easy to install, can accommodate a variety monitor sizes, is easily adjusted via one-arm maneuverability, and offers a built-in cable management feature. Pairing the arm with a USB docking station further enhances the computing experience and improves comfort, health and performance at the workstation. 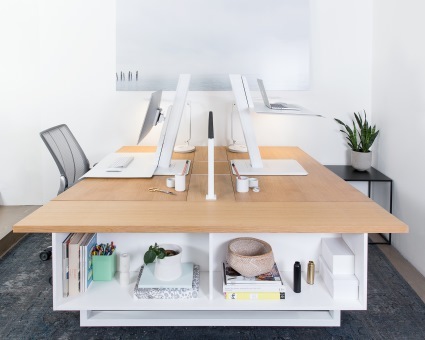 Docking stations organize all connections and eliminate cable clutter for a clean, spacious desk. The latest systems allow for USB 3.0 and USB-C compatibility to accommodate all computer users. Thinking of workspace design from an ergonomic perspective is critical now that connectivity needs are increasing, workspace square footage is decreasing, and desks are being shared at companies around the world. Today, time is at a premium and technology is essential to furthering business objectives. 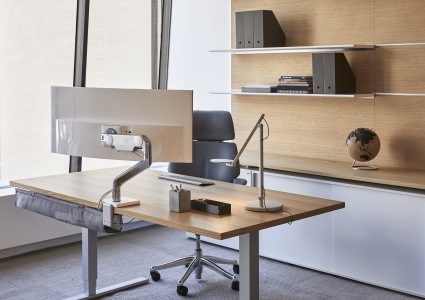 Ergonomics not only provides comfort and flexibility at an individual and organizational level, but future-proofs the workspace for years to come. ii Fulk, J., and Collins. “Wired Meetings: Technological Mediation of Organizational Gatherings.” The New Handbook of Organizational Communication: Advances in Theory, Research, and Methods. Ed. Fredric M. Jablin and Linda Putnam. Thousand Oaks, CA: Sage Publications, 2001. Print. iii Hendrick, H.W. (2003). “Determining the cost-benefits of ergonomics projects and factors that lead to their success.” Applied Ergonomics. 34(5): 419-427.
iv “Eye Discomfort in the Office.” Canadian Centre for Occupational Health and Safety. Web. 15 Nov. 2012.
v Boothroyd, K. & Hedge, A. (2007) Effects of a flat panel monitor arm on comfort, posture, and preference in an architectural practice, Proceedings of the Human Factors and Ergonomics Society 51st Annual Meeting, 549-53. * This article is written by Humanscale; FMLink is not responsible for the accuracy of its content. Should anyone wish to contact FMLink regarding any article, please e-mail FMLink at info@fmlink.com. Contact information for each organization is provided inside each paper and in the Contact All Providers section under ARTICLES.